Last November, we Glossybox gals received a Loyalty Card for 50% off at UberBeautyProducts.ca. At the time I had never heard of Uber Beauty Products. Fast forward to February and Uber contacted me and asked if I would be willing to try their products. I accepted their offer and I selected a few items. I have used these products for almost two months now. This review is my honest opinion. Uber Beauty Products has an Uber Sassy line for women and Uber Slick line for men. Each line has face, body, tanning and hair products. The hip, new beauty, hair & tanning range for men & women. Über encapsulates the finest exotic ingredients from around the world, providing a complete beauty, tanning and hair range. The products I selected to try out were from the Uber Sassy ‘A-List Fix’ Cleanser Soothing for Normal/Combination line; the Cleanser (200ml/$17.50), the Toner (200ml/$19.00), the Day and Night Face Cream (50ml/$59.00) and the ‘A-List Fix’ Mask Moisturizing for Dry/Dehydrated Skin (125ml/$22.50). The main touted ingredients in these products are frankincense and mandarin with the Day and Night cream also having sea kelp and avocado. Frankincense:This aromatic extract from the Boswellia tree has powerful aromatherapy properties to sooth and relax.The oil is naturally antiseptic with healing benefits. It promotes facial skin cell rejuvenation by improving blood supply and stimulating circulation. The Uber Sassy products come in chic white packaging with its winky smiley face logo (so cute) and has a light scent. It is quite lovely. I do believe it is the frankincense that smells so nice. Plus I think the scent is calming as well. The cleanser and toner both come with pump tops. I really like that - it makes it so much easier to use. The Day and Night cream comes in a solid frosted glass jar with a little plastic tab cover inside to keep the product from spilling on the lid. My nightly regime, in a nutshell, starts with eye makeup remover and a Neutrogena facial wipe to wipe away my face makeup. 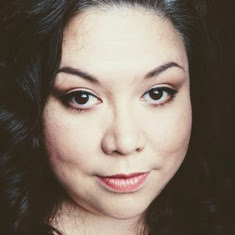 I always pre-cleanse like this as I do not feel that most face cleansers can effectively remove all face makeup and get the face cleansed properly. Then I wash my face with a cleanser and sometimes I use a toner. I will exfoliate every third day or apply a mask. Lastly, I apply my night cream and eye cream. These Uber Sassy products fit seamlessly into my nightly regime. First thing I noticed with the facial cleanser is that it has a thin milky consistency almost like skim milk. To wash my face, I used about 5-6 pumps. Which sounds like a lot but it isn’t. I have been using this cleanser for almost two months and I still have lots of product left. I rub this all over my damp face with tiny circular motions then rinse off with water. It doesn’t lather so if that is something you like, this is not going to do it for you. This cleanser leaves the skin almost squeaky clean feeling without stripping the face of its natural oil base. I prefer milky cleansers as they work best at soothing my sensitive skin. I had no issues with this cleanser at all and I really enjoy using it. I do plan on getting more. I will admit that I am not a faithful toner user. But for testing out this range I did use it. I followed up with a couple pumps on a cotton pad. It did a great job of removing any excess product and restoring balance to my skin. If I wasn’t exfoliating or applying a face mask, I would just apply my eye cream de jour and then the Day and Night Cream. When I first applied this cream, it soaked into my skin so fast I thought it dried off right away. But after a little while, my face felt baby soft. You know that soft feeling you can’t help touching over and over? LOL By morning my face felt soft and supple. Since this is a glycerine based cream I prefer to use it only at night. I truly believe this Day and Night Cream is great for sensitive skin. This Uber Sassy range actually ‘saved’ my face. I had forgotten my Neutrogena face wipes during a weekend trip on Easter break. So I trotted (okay drove) to the nearest Wal-Mart and grabbed what I thought was Neutrogena face wipes but turned out to be the Wal-mart brand. After two days, my eyes and cheeks became so irritated, burning and red from the alcohol in the cheapy wipes. I was in hell. So I doused my face with the facial cleanser and liberally applied the night cream on the affected areas. Normally when this happens (and it happens more that I would like) it takes weeks for my face to heal and get back to normal. But by the time I got home, the redness was almost gone. When I got home, I just applied my La Roche Posay serum to assist with the healing and my face returned to normal within days! So that really impressed me. 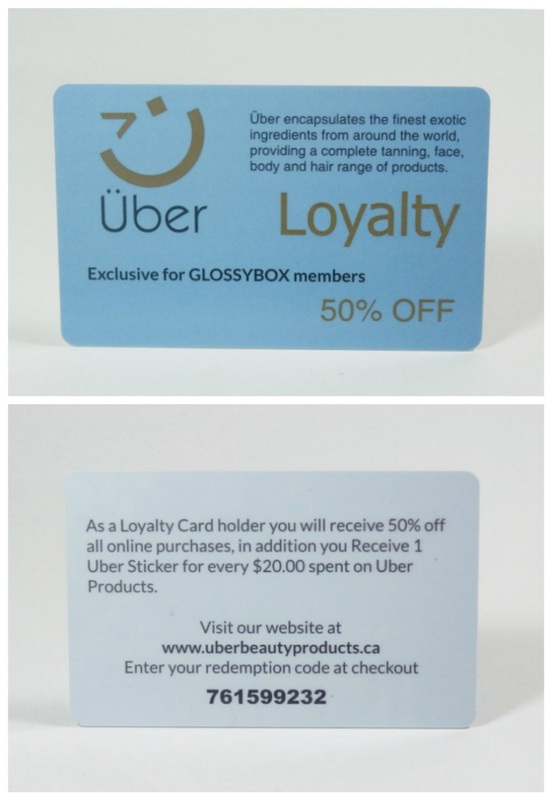 Remember I mentioned the 50% Loyalty Card Uber Sassy included in the November 2012 Glossybox? Did you know that that card was good for a year? Lost your card? Here is the promo code you can use for 50% off; 761599232. Uber Beauty Products is also letting my readers in on the deal as well. You can use the same promo code for 50% off. That means the facial cleanser would be $8.75 which is on par with most drug store cleansers. Bottom line I have to say I am pretty happy with these Uber Sassy products. The Cleanser Soothing for Normal/Combination line is pretty great for sensitive skin.Like I said before I plan on purchasing more of the cleanser for sure and maybe the night cream. I think it made for a good winter moisturiser. As you may have noticed I didn't review the mask. I will post a review on it at a later date as I have only used it twice and want to test it a bit more. Has anyone else tried Uber Beauty Products? Let me know your thoughts? **Products sent for consideration, all opinions are my own.